In the aftermath of the ghast attack, the group had a chance to explore the abandoned torture chamber and found a concealed door in one of the pillars. They were also surprised to find decades-old graffiti with the words “Lily was here”, which along with another inscription of “Onatar Protects” inspired a furious round of skill checks to work out the historical, religious or local significance of these phrases. The graffiti was a bit of a red herring, having been planted there by the Sunday gaming group as a hello to the Monday group, but it unnerved the group enough that as they entered the noxious-smelling tunnel below, one of the adventurers was heard to whisper “Here Lily, lily, lily!” I was able to pass this on to the player who had left the message via messenger for added hilarity. 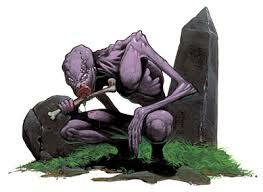 A lone ghoul lay in wait in in the dark, and it was summarily killed by Darmon in a flurry of magic missiles, and anticipating a short scouting opportunity, roughly half the group followed him down to explore. The rest stayed up the top, ready to follow, but keeping an eye on a door to the north that hadn’t as yet been explored. The stinking and claw-scarred tunnel came out into a long-abandoned and pillaged crypt, full of broken coffins and splintered, gnawed bones. It was also occupied by a number of ghouls, lesser cousins to the previously encountered ghasts, led by an as-then unseen presence. A fireball from Darmon cleared the immediate threat, but scuttling noises from around corners and the commencement of an eerie, unsettling weeping and crying prompted the group to advance carefully, calling for backup. A sudden flash of something doglike, pale, with too many limbs, and the barking cries of more ghouls put the group on edge, and then a new assault was under way. At first there were a couple more ghouls as advance scouts, and the warforged who had pressed ahead took the brunt of the initial assault with minor injuries. Then the rest of the undead in the hall pressed the attack. The remaining ghouls, accompanied by a necrosis carnex and a strange eyeless and emaciated figure that was the source of the weeping closed in, with the carnex in the middle of the pack and the wheep skirted round the edge of the melee to close with the more vulnerable members of the group. The first few ghouls fell quickly, but then the warriors discovered why the disturbingly patchwork creature was in the middle of the group. As they slew it, the carnex exploded in a burst of negative energy. This hurt every living being within ten foot, and strengthened the undead forces remaining with a surplus of energy that made their forms swell and crackle with force. The wheep proved to be a tough and fast assailant, dripping venomous bile that welled from its eye sockets, ripping chunks from Ruin as he tried to defend Darmon. At this point, Keil arrived and summoned lightning to try and push the creatures back, but the battle was in too close quarters for now, and he ended up inflicting as much damage on his fellow adventurers as on the remaining undead. The remaining ghouls and the wheep were put down with the aid of a particularly fortuitous critical strike by Bumperklart which no doubt prevented any further deaths, but it came too late for Darmon, who once more lay in a pool of blood, singed by lightning and magics. This time, the attempt to reincarnate him failed (quietly requested by the player in a chat message whisper) and the group retreated back up the tunnel, leaving alarm spells in place over the other exits from the crypt. The danger level is definitely rising and with my deliberately ramping up the atmospheric descriptions there is a sense of foreboding and uncertainty over the group’s adventures. In many ways, despite still using published material as the bare bones, I’m freewheeling a lot more of the challenges and encounters, adding layers of complexity that is starting to be appreciated both in and out of character by the players. For example, wheeps are rarely encountered away from the patronage of more powerful undead, but are occasionally sent to retrieve items or remains for their masters. The mystery of this wheep and it’s companions remains to be uncovered.